Calculating an employee’s final paycheck used to be hard. GoCo now makes it super easy! Employee & Company Benefit Deductions (Health, Dental, Vision etc). Terminating an hourly employee? No problem. We allow you to adjust the number of hours the employee has worked for their last pay period. 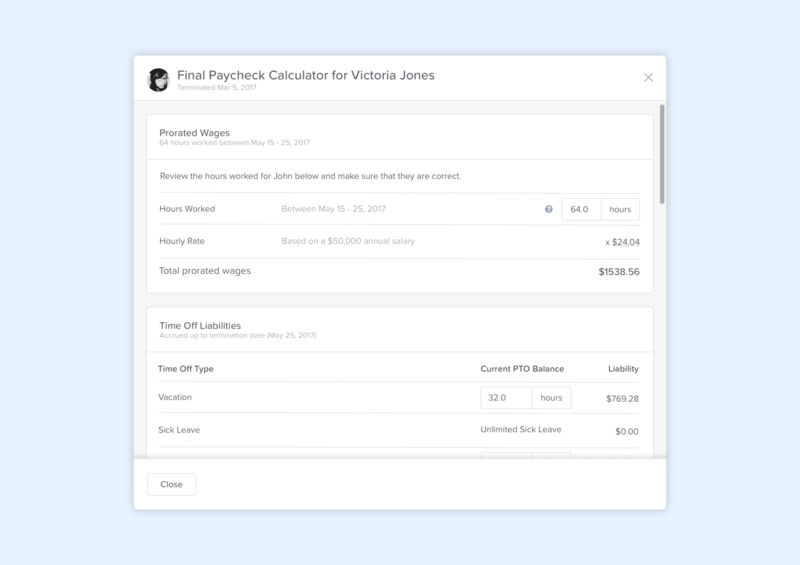 The final paycheck calculator is only available to customers who sync their payroll using GoCo’s Payroll Sync. Go to an employee’s profile, and open the Actions menu, then choose Terminate. Go through the termination flow, then submit the termination. The admin(s) who manage payroll will receive a task notification in GoCo to issue the final paycheck right away. The final paycheck calculator can be found within the Issue Final Paycheck task and on the terminated employee’s profile within the Termination card. The payroll admin can then use the final paycheck calculations to issue the final paycheck whenever they deem fit. NOTE: Some states have certain laws and requirements regarding when you are required to issue the final paycheck for terminated employees.